In our house, laundry seems to magically appear. It seems that the hampers, baskets and random piles never seems to disappear. Followed by the morning bellow of –mom I don't have any clean socks- the laundress of the house can get a little testy. 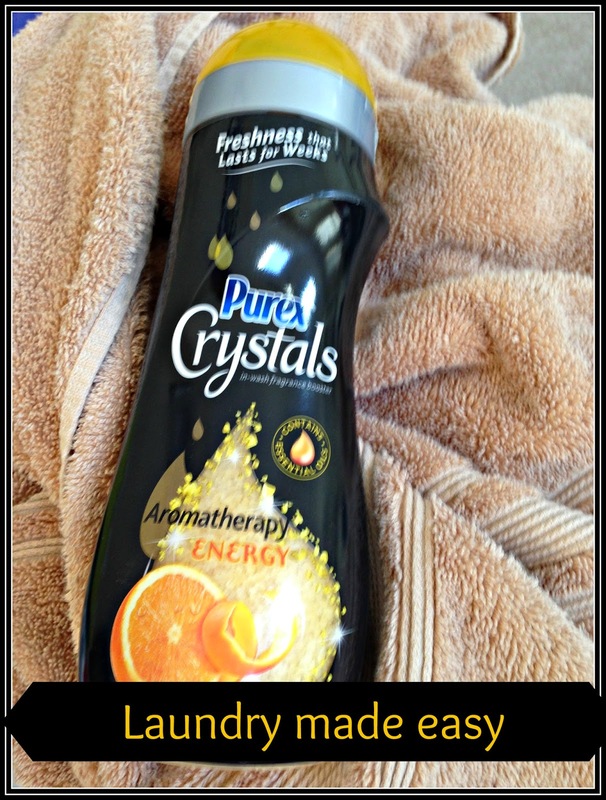 Purex wants to help make laundry a little less stressful with Purex Crystals Aromatherapy. Purex Crystals Aromatherapy has wash in scent booster that stimulate the senses. The idea is to choose a scent that can make those piles of laundry seem less burdensome. The Purex line has three scents, Aromatherapy energy, Aromatherapy well being and Aromatherapy serenity. Each scent infusion is created with citrus and florals, which are blended with essential oils. The idea is to use the various scents to help boost you mood. Since I seem to be lacking in the energy department, I choose the Aromatherapy energy for the mound of pool towels that I needed to tackle after a weekend swim meet. While it wasn’t like drinking a red bull, I did feel less overwhelmed while folding all the towels. The scent was bright and uplifting. More importantly it wasn't overly floral (boys don't like smelling like a girl). I will keep a container or two of the Purex in the house. Laundry can be a tireless job. But with Purex it can seem a little less overwhelming. Would you like to try the new Purex Crystals? Please use the Rafflecopter to enter.